As a parent, you want the best for your child. You know the value of giving your son or daughter everything they need to be as successful and accomplished as possible. But when your schedule is full and life gets demanding, it can be challenging to find ways to engage your child in effective, immersive Montessori-style activities. Don’t feel discouraged or overwhelmed, though, because even when your own schedule is busy and demanding, there are many ways you can easily incorporate daily family activities that bring out your child’s best and encourage their physical, emotional, intellectual, and social development. Here are three practical, productive ways to enhance your son or daughter’s Montessori education at home. Raising a preschool or primary school aged child requires time and focus. When you add on the demands of a spouse, additional children, a career, a home to care for, pets, volunteer work, and other life needs, it’s easy to be distracted or get frustrated. And young children can respond to stress by acting out. Rather than giving your child a timeout when they are engaging in problem behaviors, switch gears and give them a “time in.” Set aside everything else you are doing to focus fully on your child. Often, a little time spent engaging with your son or daughter, giving them your attention, and having fun can solve behavioral issues without the need of a punishing time out. Activities you might use to help yourself and your child enjoy the benefits of a “time in” session include doing a puzzle together, drawing or painting a picture, playing outside, or any other activity that engages your child’s interest and is calming. Even a little snuggle time can be enough to help your child switch gears into healthier behavior. The key is to place your full focus on your child during the “time in” activity so he or she is reassured that you are present for them and that you care for them. 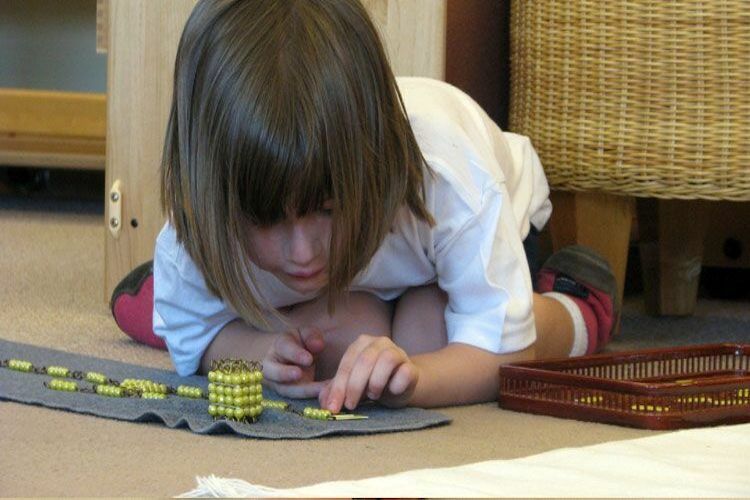 Your child’s Montessori experience doesn’t need to start and end in the classroom. In fact, a driving principle behind the Montessori approach is that the classroom is everywhere. Children can explore the world and learn new things at every moment of the day, no matter where they are. To reinforce and build upon what your son or daughter is learning at Primary Montessori, you can create learning experiences in your home. And you can do so intentionally by setting up several areas where your child can engage in play, experimentation, and practice of everything they learn in the classroom. These invitations to engage promote your child’s curiosity, giving them the opportunity to choose what they’re interested in doing. You’re likely to hear a lot fewer complaints of “I’m bored” if you provide chances for your son or daughter to explore and play in their home environment. Flower play—Give your child a bunch of flowers and let them explore, pulling off petals, examining the colors, and more. Spices tray—Choose spices with colors, textures, and tastes that will appeal to a child without being overwhelming, and encourage your son or daughter to explore. Sensory bins—Equip your child to explore and discover shapes, sizes, colors, fabrics, and other textures and traits by compiling bins of objects that share one of these traits, while differing in others. Stacking games—Provide Russian stacking dolls, stackable plastic measuring cups, or other child-friendly objects that your son or daughter can practice putting together or pulling apart. Counting or naming activities—As you drive with your child, take turns pointing out objects and counting them or identifying them. Even in the midst of busy schedules, stressful activities, and other challenges, it’s important to intentionally create routines and bonding activities that you and your child can enjoy every day. The routine helps your child develop a sense of boundaries and confidence in the world. The bonding encourages everyone in your family to connect and focus on what matters most to you—each other! Learn More! Call us today at (301) 309-9532 or go online to see our extended care hours or to schedule a tour and discover how Primary Montessori Day School can equip your son or daughter for a successful, fulfilling life.